Jason Hines took this photo of the supermoon over the Grand Canyon North Rim on June 23, 2013. He used a Nikon D800e, Nikon 800mm lens, and a 1.7x teleconverter to capture the image. 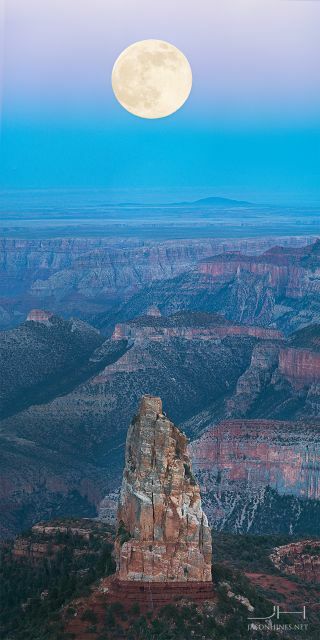 An avid night sky photographer captured this amazing photo of the June supermoon full moon over the Grand Canyon. Photographer Jason Hines took this image June 23 during the brightest and biggest full moon of 2013, a so-called supermoon. His observation point was the Grand Canyon North Rim with a Nikon D800e, Nikon 800mm lens, and a 1.7x teleconverter. This photo is among many images Hines has shot for a feature-length documentary titled, "The Art of the Chase," which can be found on Kickstarter. During the moon's fullest phase, the orb was at its closest point to Earth, called perigee. This created a supermoon, when it appeared about 12 percent larger than normal full moons.